I remember playing ‘Battleship’ as a kid. I remember it being a little like chess, requiring determination, logic, strategy, and a bit of fun. 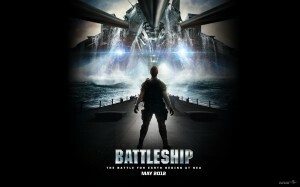 Unfortunately, the film ‘Battleship’ has none of that. It’s a complete calamity on all levels, with the exception of some incredible special effects. FACT: ‘Battleship’ has a run time of 131 minutes. That’s over two hours, folks. In that span of over two hours (which I’ll never get back), the film failed in storytelling, action sequences, logic, and character development. The whole film was laughable and made no sense at all. It’s as if a third grader made the film. And that’s sad, because I like director Peter Berg. He’s done some really good stuff like, ‘The Rundown’ and ‘Very Bad Things’. But with ‘Battleship’, he missed the mark by a good 100 feet. This disaster of a film follows Alex Hopper (Taylor Kitsch), an irresponsible and idiotic guy who is actually fairly intelligent, but who chooses to make dumb decisions. In order to impress a girl at a bar, he steals a chicken burrito from the neighboring convenience store and gets caught and tasered by the cops. Only then, does he decide to turn his life around and become like his older brother, Stone Hopper (Alexander Skarsgard aka Eric from ‘True Blood’), who is a commanding officer in the Navy. Meanwhile, a group of independent scientists who are not really affiliated with any real company, send a big transmission out into space to a newly discovered planet. They hope to make contact with sentient life on that planet. BIG MISTAKE. It turns out that the transmission reached some not-so-nice aliens that are now quickly flying through space to destroy Earth. Once the aliens land in the ocean and on land, the Navy sends several of their large ships out to investigate. Suddenly the aliens trigger a several-mile-wide domed force field so nobody can get in or out. And guess what? The brothers Hopper are inside that force field. 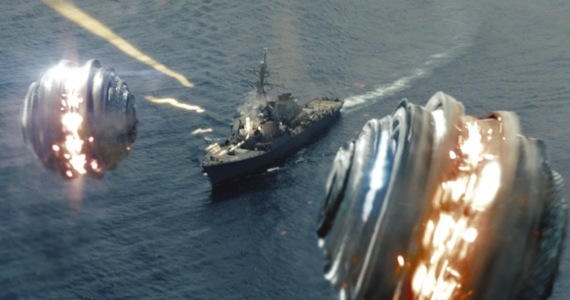 From here on out, it’s a fight to the death with the aliens by literally trying to sink their battleships. Now, that might sound fun and entertaining, but the film literally sinks itself. There are entirely too many sub plots that destroy the main plot. Whether a subplot dealt with romance, fighting between sailors, physical therapy, or gaining enough courage to ask a father for his daughter’s hand in marriage, none of it made sense. The acting was also terrible. I mean, Liam ‘Jedi’ Neeson is in the film, which was promising. But he seemed to only be there for a paycheck and totally dialed it in. And this is Rihanna’s big film debut, but she falls flat on her face. I can safely say that she is one of the worst actors since David Schwimmer. Her delivery is emotionless, and she appears to spend the entire film reading off cue cards. One thing the film did well was the special FX. They were top-notch. The aliens were dressed in gear resembling what is worn in the video game Halo. They also had some very cool and original weapons. The alien spacecrafts and ships were realistic and detailed. Obviously all of the attention and most of the budget went to the special effects because there was nothing left for the rest of the film. All the production decisions for ‘Battleship’ seem to have been made by a movie studio executive that has no pulse on what people want in a film. Were the directions to Peter Berg for him to make a film from a poorly written script, hire a pop singer, and just focus on the alien visuals? Let’s be honest –it doesn’t matter. What was willingly released in theaters is a confusing, unorganized, and utter failure of a film. Don’t waste your time or money on this film. Dust off your old board game. You’ll have a lot more fun. Film Review: ‘Hunt for the Wilderpeople’! This entry was posted on Friday, May 18th, 2012 at 4:57 pm	and is filed under Film, News. You can follow any responses to this entry through the RSS 2.0 feed. You can skip to the end and leave a response. Pinging is currently not allowed. « Bryan Reviews ‘Crooked Arrows’!! !